After years of anticipation, which was only heightened with the small tease in Avengers: Infinity War, Marvel Studios have finally given us our first glimpse at the 21st instalment in the ever expanding Marvel Cinematic Universe: Captain Marvel. 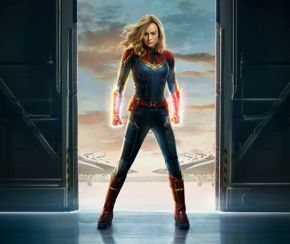 Set back in the 1990’s, Captain Marvel follows former pilot Carol Danvers, played by Oscar-winner Brie Larson, who becomes the most powerful superhero in the Marvel Universe. This is technically an origin story, but will have Carol all powered-up from the start. Directed by Anna Boden and Ryan Fleck, the film is also set to tell the beginning of a new story arc, focusing on a new alien threat in the green shape-shifting form of the Skrulls, lead by Ready Player One’s Ben Mendelsohn, who are engulfed in a war with the blue alien race known as the Kree, led by a returning Lee Pace as the hammer-wielding Ronan. Fans were unsure of what to think about the film when set pictures began to leak online, but its safe to say that Marvel Studios knew what they were doing, with what looks like an interesting take on the iconic character. The new trailer does a great job of establishing the 90’s setting, opening with Carol plummeting through the ceiling of a Blockbuster Video store, but it remains sketchy on story details with only hints at what to expect. This also gives us our first look at a younger Nick Fury, holding his now infamous pager, played once again by Samuel L. Jackson, Jude Law as Walter Lawson/Mar-Vell, and finally the big screen return of Agent Phil Coulson, played by Clark Gregg. It looks like Marvel will have another hit on their hands as the final piece of the puzzle falls into place before the final showdown with the mad titan Thanos in the still untitled Avengers Four (2019). Captain Marvel will be released on March 8th.